As of tomorrow I’ll be getting on the road to head to the parents place for the White Family Christmas celebration. Updates to the blog will be slow over the next week as I’m away, but I’ll still be on Twitter from time to time. To all my friends, clients, new pals, arch-enemies, colleagues, agents and all in between … wishing everyone a safe and happy holiday as we bring 2011 to a close. Have fun! So you could say you always have a ‘White’ Christmas…huh? Have a good one and all the best for the New Year! Happy Holidays! Clever those Signalnoise snowflakes are. Ha! I laughed out loud at the jug o’ joy! Christmas always calls for moonshine! Didn’t one of the wiseman say that to Joseph & Mary? Thank you to you too, James! I hope the white stuf is in your area because here in Ontario it is pretty green, eh. Here’s hoping you have a “White” Christmas! Best in 2012 (if the end of the world does not happen)! 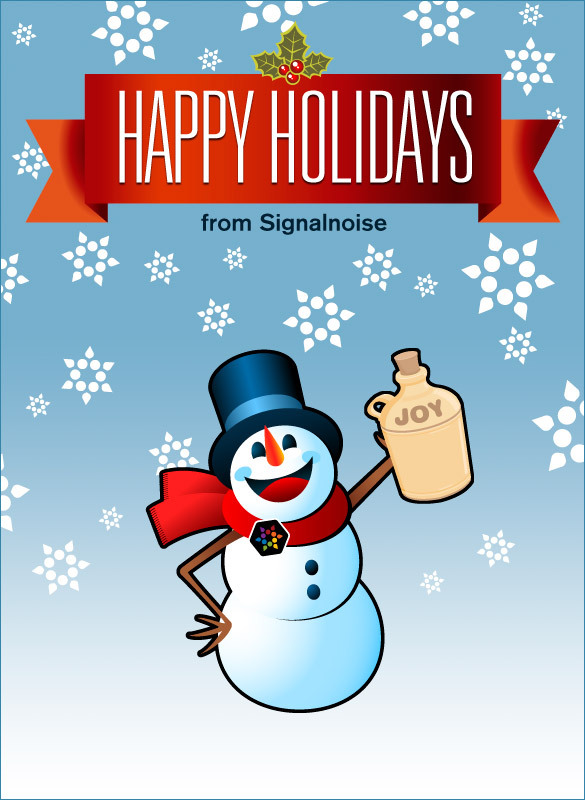 Happy Holidays to Signalnoise and the White Family! Happy Holidays to you and yours! Great work this year bro!